Cancer is one of the major causes of morbidity in veterinary patients, and surgical removal of tumors one of the most common surgical procedures performed by veterinarians. This article covers tumor evaluation and biopsy, grading and staging, and surgical approach. 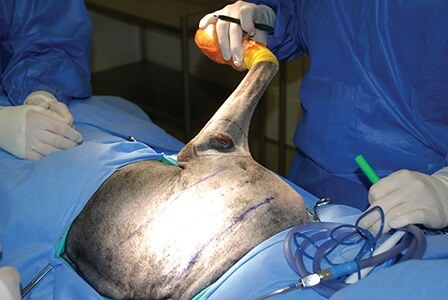 Cancer is one of the major causes of morbidity in veterinary patients, and surgical removal of tumors is one of the most common surgical procedures performed by veterinarians. Potential need for adjunctive treatments, such as chemotherapy or radiation therapy. Regardless of the treatment options sought, the overall goal of the therapeutic plan is to improve the patient’s quality of life. The annual physical examination plays a key role in detecting neoplasia, either directly via palpation or through paraneoplastic syndromes, which may be found on routine blood and urine analysis. The physical examination allows detection of possible tumor presence and identification of concurrent conditions that may influence the treatment plan. When a tumor is identified, record its size, location, and gross appearance, and palpate regional lymph nodes. If the lymph nodes are enlarged, firm, or immovable, the suspicion of a metastatic neoplasm rises; however, normal lymph node palpation does not guarantee lack of metastasis. Therefore, some form of lymph node biopsy is recommended in most cases. 1. Fine-needle aspiration (FNA) is a cost-effective, minimally-invasive procedure that is useful for differentiating non-neoplastic from neoplastic diseases and, in many situations, obtaining a definitive diagnosis. FNA is usually reserved for cutaneous and subcutaneous masses; some tumors, such as mast cell tumors and lymphoma, are readily identifiable on most needle aspirates. However, FNA is generally the least diagnostic biopsy technique due to the minimal amount of tissue sampled and lack of organized tissue architecture, which prevents tumor grading. Certain tumor types, such as sarcomas, may not exfoliate cells well, leading to false-negative results. Interpret negative aspirates or aspirates with questionable results with caution, and utilize more aggressive biopsy techniques when clinically appropriate. Jamshidi needle-core biopsy (ossified tissue). Collecting multiple tissue samples increases the accuracy of biopsies. 3. Incisional biopsy is utilized when less invasive techniques fail to yield a diagnosis. Especially useful for diagnosis of soft, friable, inflamed, and/or necrotic tumors. For most cases, include the border between normal healthy tissue and abnormal tissue, which allows the pathologist to determine extent of tumor invasion into normal tissue. 4. 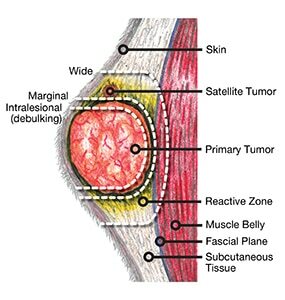 Excisional biopsy allows the identified tumor to be removed in its entirety, with or without additional surgical margins. It may provide a diagnosis and, therefore, a therapeutic plan, but the mass is removed without knowing the tumor type. It is also often impossible to excise the mass without contaminating clean tissue planes or complicating future surgical procedures. A less invasive biopsy procedure is generally recommended to guide the surgeon in choosing the appropriate method of surgical resection. Excisional biopsy is best reserved for cases in which adequate surgical margins are easily achievable with biopsy alone (eg, small cutaneous mass on trunk of a dog). Carefully plan the biopsy procedure to prevent spread of neoplastic cells to unaffected tissues and allow removal of biopsy tracks or scars during surgical excision of the tumor. When obtaining a biopsy from a vascular organ, such as the liver or spleen, coagulation testing should be considered. Owner’s willingness to treat may be altered based on diagnosis. Once the biopsy is collected and properly preserved, have it processed and evaluated by a histopathologist. Tumor grade is the histopathologic assessment of the tumor’s aggressiveness, and includes information, such as the mitotic index, invasiveness into surrounding tissues, and degree of differentiation. This information is valuable when the surgeon is developing a treatment plan for the patient. For some tumor types, the grading scheme may also include features, such as percent necrosis; for these neoplasms, a grade may not be accurately assessed by incisional biopsy. If the tumor is suspected to be malignant, tumor staging establishes to what extent the tumor has invaded local, regional, or distant (systemic) tissues. Method of tumor metastasis is highly dependent upon the tumor type: Carcinomas and round cell tumors tend to spread via lymphatic routes, while sarcomas tend to spread via hematogenous routes. Common areas where metastatic disease is identified include the lungs and lymph nodes. Biopsy (as mentioned earlier, lymph node palpation does not guarantee lack of metastasis). Additional diagnostics, such as abdominal ultrasound, may be needed depending on the biologic behavior of the tumor. Other modalities, such as computed tomography or magnetic resonance, may help increase the sensitivity of detecting metastatic disease and more accurately determine the local extent of the tumor in an effort to determine prognosis and help guide resection. Careful surgical planning should be performed, as the first surgery is often the surgeon’s best chance for achieving a positive outcome. Figure 1. A representation of a primary soft tissue tumor (blue), tumor pseudocapsule, and surrounding reactive zone (yellow), along with two satellite tumors (light blue); the lateral margins of the 4 levels of surgical resection are depicted (dotted lines): intralesional (inner most black dotted line), marginal (black dotted line at the level of the pseudocapsule), wide (white), and radical excision (chartreuse). Illustration by Michael Orencole. Availability of adjunctive therapy, if needed following surgery. Radical resection is removal of an entire tissue compartment. Examples include removal of a complete organ, such as splenectomy to remove a splenic hemangiosarcoma or limb amputation to treat appendicular osteosarcoma. Depending on tumor location, type, and size, radical resection is occasionally needed to completely excise the primary tumor and its surrounding pseudocapsule and satellite tumor cells. In some cases, adequate surgical margins may be too disfiguring, painful, or expensive; minimally advantageous; or simply incompatible with life.2 Therefore, when planning radical resections, strongly consider patient quality of life. Lateral margin width is determined by tumor type and biologic behavior. Benign tumors and most malignant carcinomas can be completely resected with 1-cm lateral margins. In order to accurately achieve the desired lateral margin, use of a surgical marking pen and ruler is advisable (Figure 2). Figure 2. Mark the lateral surgical margins with a surgical marking pen; for this soft-tissue sarcoma, the edge of the visible tumor is first marked, followed by marking a 3-cm lateral margin. Figure 3. Deep surgical margins are dependent upon the tissue layers and fascial planes, not actual measured depth. The intralesional margin is an incomplete resection inside the surrounding pseudocapsule (black line), marginal resection is dissection exterior to the surrounding pseudocapsule within the reactive zone (yellow), and wide margin resection removes both microscopic and macroscopic disease, including at least 1 fascial layer. Illustration by Michael Orencole. Careful tumor handling is required to prevent exfoliation of cells and local recurrence.2,6,8,9 To minimize seeding of neoplastic cells, avoid direct handling of the tumor and change surgical gloves and instrument packs between tumor excision and closure. If the resection is marginal, it is helpful to “pin” the tissue on cardboard, which prevents shrinkage during fixation. Marking the surgical margins with ink (eg, India ink) or suture strands helps the pathologist determine the extent of tumor resection. With large tumors, making several partial thickness slices (ie, “loafing”) with a scalpel blade ensures the entire sample is adequately fixed. Substantial tissue biopsies yield better diagnostic results. Multiple tissue samples increase the overall understanding of the sampled site. When handling tissue samples, take great care to avoid iatrogenic artifacts. Always submit tissue samples to a pathologist along with pertinent, detailed information about the patient and tissues biopsied. Remove any biopsy tracks or scars during tumor excision. Capable of improving the patient’s quality of life. Poston GJ. Is there a surgical oncology? Textbook of Surgical Oncology. London: Informa Healthcare, 2007, p 1. Farese JP, Bacon NJ, Liptak JM, Kow K. Introduction to oncology for the general surgeon. In Tobias KM, Johnston SA (eds): Veterinary Surgery: Small Animal. St. Louis: Elsevier, 2012, pp 304-324. Liptak JM. The principles of surgical oncology: Diagnosis and staging. Compend Contin Ed Pract Vet 2009; 31(9):E1-E12. Bonfanti U, Bussadori C, Zatelli A, et al. Percutaneous fine-needle biopsy of deep thoracic and abdominal masses in dogs and cats. J Small Anim Pract 2004; 45:191-198. Aitken ML, Patnaik AK. Comparsion of needle-core (trucut) biopsy and surgical biopsy for the diagnosis of cutaneous and subcutaneous masses: A prospective study of 51 cases. JAAHA 2000; 36:153-157. Soderstrom MJ, Gilson SD. Principles of surgical oncology. Vet Clin North Am Small Anim Prac 1995; 25:97-110. Ehrhart N. Principles of tumor biopsy. Clin Tech Small Anim Pract 1998; 13:10-16. Withrow SJ. Surgical oncology. In Withrow SJ, MacEwen EG (eds): Small Animal Clinical Oncology, 3rd ed. Philadelphia: Saunders, 2001, pp 70-76. Dernell WS, Withrow SJ. Preoperative patient planning and margin evaluation. Clin Tech Small Animal Pract 1998; 13:17-21. Withrow SJ. Surgical oncology. In Withrow SJ, MacEwen EG (eds): Small Animal Clinical Oncology, 3rd ed. Philadelphia: Saunders, 2001, p 70. McChesney SL, Withrow SJ, Gillette EL, et al. 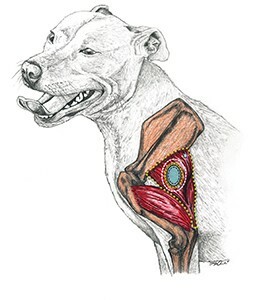 Radiotherapy of soft tissue sarcomas in dogs. JAVMA 1989; 194(1):60-63. Simpson AM, Ludwig LL, Newman SJ, et al. 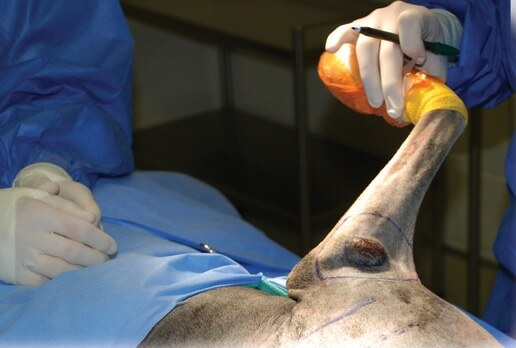 Evaluation of surgical margins required for complete excision of cutaneous mast cell tumors in dogs. JAVMA 2004; 224:236. Einstein R, Sorgente N, Soble LW, et al. The resistance of certain tissues to invasion: Penetrability of explanted tissues by vascularized mesenchyme. Am J Pathol 1973; 73:765. Liptak JM. The principles of surgical oncology: Surgery and multimodal therapy. Compend Contin Ed Pract Vet 2009; 31(9):E1-E14. Michael J. Orencole is a senior veterinary student at Mississippi State University College of Veterinary Medicine. He has a strong interest in small animal surgery, and has served as an assistant instructor for the veterinary anatomy course and published several corresponding anatomy video tutorials. Mr. Orencole presented research at the Merial/NIH National Scholars Symposium and MSU-CVM’s Research Day in addition to serving as a student ambassador for MSU-CVM. He has been the recipient of several academic scholarships and awards, including the Dr. Jack Walther Leadership Award and AVMA PLIT Scholarship. Ryan Butler, DVM, MS, Diplomate ACVS (Small Animal), is an assistant professor in the Department of Clinical Sciences at Mississippi State University College of Veterinary Medicine. Dr. Butler’s clinical interests include all aspects of small animal surgery, especially canine orthopedics and maxillofacial surgery. He has received numerous awards for his academic and research endeavors, including the Mark S. Bloomberg Resident Research Award presented by the Veterinary Orthopedic Society. Dr. Butler received his DVM from MSU, completed an internship at Texas A&M University, and returned to MSU for his surgical residency.